Successfully Added Wallet 1.5 Inch Digital Frame - 2GB Flash Memory to your Shopping Cart. Digital frame, just the size of several credit cards, perfect for slipping in your wallet or purse, with 2GB of memory and a crisp 1.5" LCD screen. This is a future tech version of the old fashioned pictures collection in your wallet or purse. Slender but full of functions, it is like having hundreds and thousands of your pictures always with you, all in the size of several credit cards stacked on top of each other. Also handy, this product can be used as a USB flash drive for 2GB's of convenient mass storage for easily carrying files from home to work and back. 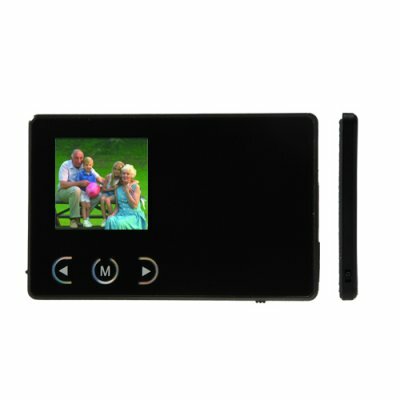 Used as a photo viewer / digital photo frame, you have a portable 1.5 inch display with simple controls for scrolling through the stored pictures. Better still, the built-in software launches when the USB is inserted into your computer, allowing you to easily load up new pictures, which are automatically resized to 128x128 for proper viewing on the 1.5inch screen. Works like a digital photo frame as well as a standard USB memory card. Built in software converts photos to 128x128 for proper viewing on 1.5 inch screen. Makes a great gift for yourself or the one you love. Bonus feature - can be used as a e-book reader. Load up love poems to share with your sweetheart! The form factor is perfect for carrying in your purse or pocket.